Description Increased data transmission and PoE powerAt present, PoE-enabled devices such as IP cameras, wireless access points and IP phones are becoming basic network devices because of their ease of installation. However, due to UTP cable specifications their range is limited to 100 meters. The POE-E201 is a repeater that transmits both Ethernet data and PoE power to increase the PoE installation range. No need for additional power or POE-E201 configurations when plugged into the network allows you to increase the distance between PoE nodes to 200m. It is also possible to connect more PoE-E201 devices in series and extend the range to multiply distance.Thanks to its functionality, the POE-E201 is the perfect solution for service providers, campuses or public places where PoE is required. Enables centralized power management in an easy and efficient way.Easy to installThe POE-E201 PoE Extender is very easy to install - just plug it into the network between the power supply and data (PSE) and the receiver (PD); Power is transferred without interruption of data transmission. The POE-E201 offers an inexpensive, quick-to-deploy solution for increasing the distance between network devices. The device enclosed in a compact housing has 2 RJ-45 ports, one of which is data input and PoE power supply, and the other is PoE data output and power supply. The output port also acts as a PoE mixer that sends DC current through the UTP cable to the PD receiver. 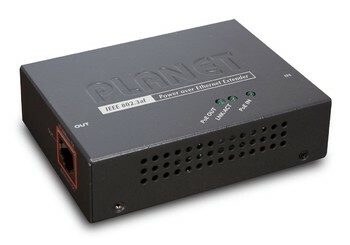 PLANET POE-E201 is a newly designed simple device which extends both the reach of Gigabit Ethernet Data and IEEE 802.3at / 802.3af Power over Ethernet over the standard 100m (328 ft.) CAT. 5/5e/6 UTP cable to 200m, 300m, 400m and maximum 500m. Currently, PoE supported networking devices such as PoE IP cameras, PoE wireless access points and PoE IP Phones have become the mainstream of network deployment because of the convenience of easy installation regardless of additional power supply. However, limited by the UTP cable specifications, only up to 100 meters (328 ft.) of cable could be applied for IP-based and PoE powered devices (PD) installation. Therefore, the POE-E201 is designed as the repeater to forward both Gigabit Ethernet data and high power PoE power, and thus extend the range of PoE installation. By just plug and play without additional power supply and setup, one single POE-E201 can increase the PoE range to 200m. By daisy-chaining multiple POE-E201s, it offers you great flexibility to extend the distance of PoE network to triple, quadruple further in length or more. Providing high power PoE and Gigabit Ethernet data extension ability, the POE-E201 is an ideal solution for service providers, campuses and public areas networking applications which require PoE deployment of wireless access points, IP-based surveillance or IP phones in any places. It enables you to centrally manage the power easily, efficiently and cost effectively. The POE-E201 Gigabit high power PoE Extender is quite easy to be installed by simple plug and play. It is used between a Power Source Equipment (PSE) and the Powered Device (PD). The POE-E201 injects power to the PD without affecting the data transmission performance. The POE-E201 offers a cost effective and quick solution to doubling the standard range of PoE from 100 to 200 meters. This Gigabit high power PoE Extender is designed in a compact mini box containing 2 RJ-45 ports, of which the "PoE IN" port functions as PoE (Data and Power) input and the "PoE OUT" port on the other side functions as PoE (Data and Power) output. The "PoE OUT" port is also the power injector to transmit DC voltage in the Cat. 5/5e/6 cable and transfer data and power simultaneously between the PSE and PD.